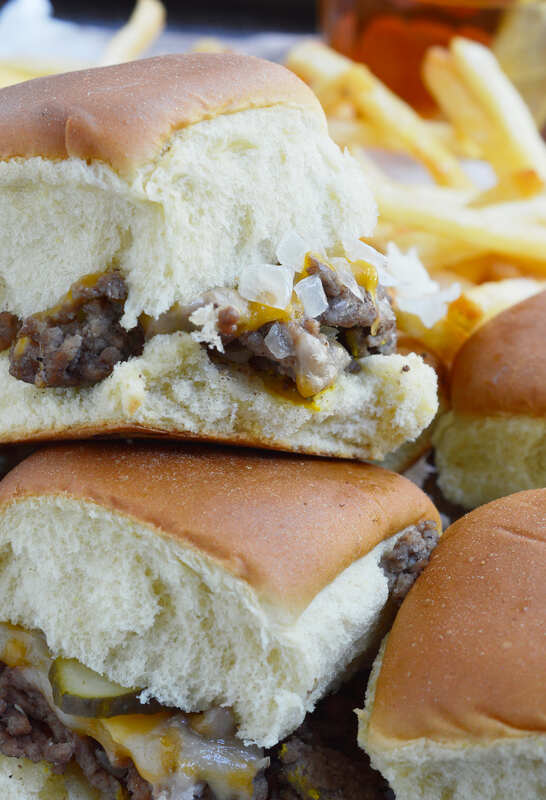 These Oven Baked Mini Burgers are inspired by my favorite fast food, White Castle and Krystal Burgers. This copycat recipe for my ultimate craving is perfect for feeding the family or a large crowd on game day! Don’t forget the fries and sweet tea! 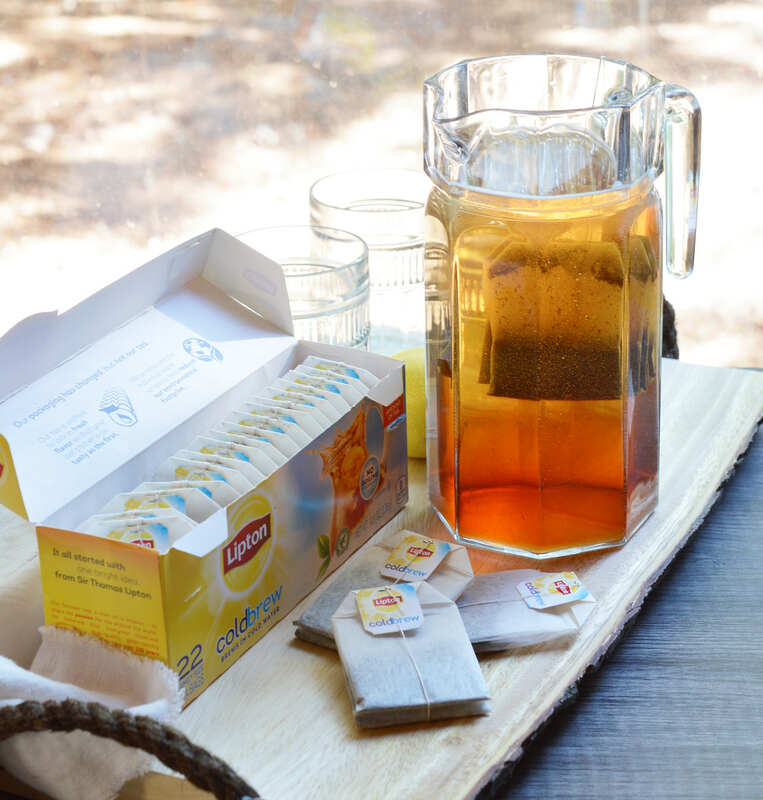 I am proud to be partnering with Lipton to bring you this tasty recipe! I’m known for being a total California girl. But what many people don’t realize is that I am originally from Georgia. So that line in the first paragraph should be: Don’t forget the fries and the Swaaayyyt Taaayyy! Even though I’ve lived in California for more than a decade I still cannot drink tea without craving Krystal Burgers. For those of you not in the Eastern US, Krystal is a fast food chain in the south that is very similar to White Castle up north. There’s this whole North vs South but I’ll just tell you that they are both great and like I said, very similar. Twice (or more) a week I would go get a sack of Krystal burgers, fries and a large sweet tea . . . known in the south as just tea. Oh and, it is perfectly acceptable to eat a sack of mini burgers by yourself. In fact, I think that is the expectation. While I love the mini burgers, my southern tea craving is still strong. Nowadays I use Lipton cold brew to make my tea. It is fast, super convenient and tastes great! When I get a tea craving or decide I want to serve tea with my meal it only takes 5 minutes to make. No boiling or cooling required. Since I am now a California girl I usually sweeten it with a low-cal sugar alternative. Accckkk! Don’t tell any of my family down in Georgia or they may just disown me! This recipe is loosely inspired by my beloved fast food mini burgers. I got all the flavor into these little sliders but I don’t take the time to make mini patties or steam cook the meat. It curbs my cravings and actually I like this homemade version even more. Start by sautéing sweet onions then cooking the meat. I try to keep the ground beef in larger pieces because it tends to stay on the buns better that way. Once the onions and meat are cooked it is all about layering. Then just bake until melty and you are ready to go! 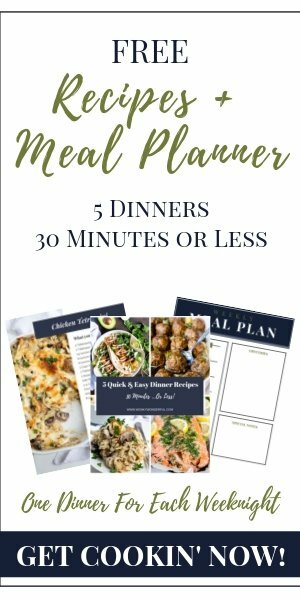 Plan on making a lot of these if you are having a party or a large family meal. Adults will eat at least two or three . . . or four. And these are great for kids because one is just the right size for them. This is when I spread out the mini burgers, fries and tea. We do a self serve table for meals like this. I sit down and enjoy my taste of southern heaven. My southern accent has been known to sneak back when I make this meal . . . which my daughter absolutely loves! I sip on my Lipton cold brew tea while I tell my daughter all about delicious southern food, humidity so thick it feels like you could cut the air with a knife and a place where everyone smiles and waves whether you know them or not. These are the type of moments that we cherish. Enjoying our favorite food, drink and company. What are your meaningful mealtime moments? 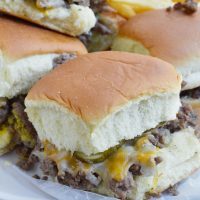 These Oven Baked Mini Burgers are inspired by my favorite fast food, White Castle and Krystal Burgers. 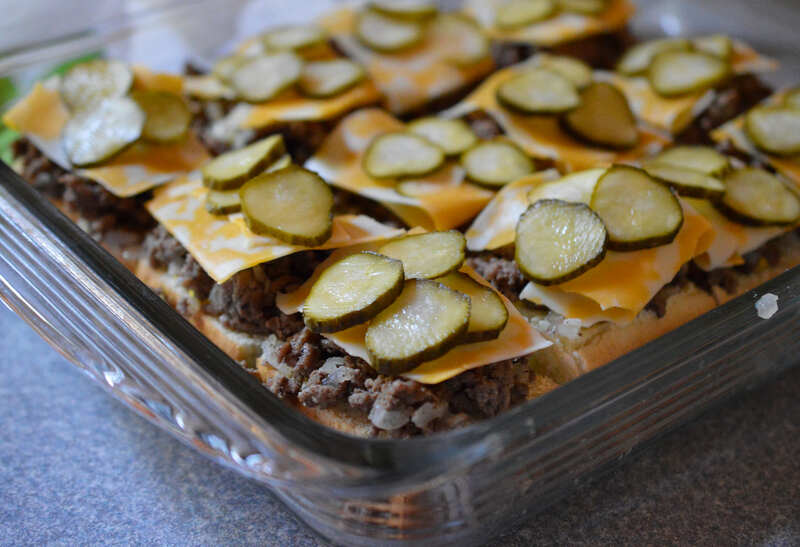 This copycat recipe of my ultimate craving is perfect for feeding the family or a large crowd on game day! Saute onions in oil until translucent. Set aside. 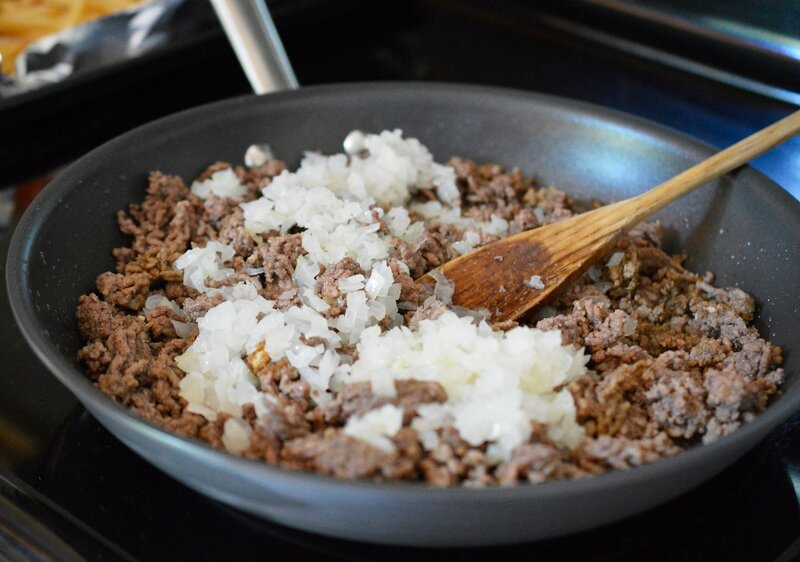 Brown ground beef chuck, drain and return to pan. Add butter, onion powder, garlic powder, pepper, salt and worcestershire sauce. Cook until butter melts and spices are incorporated. Add cooked onions and turn off heat. Place bottoms of rolls into a large casserole dish. Generously smear with yellow mustard. 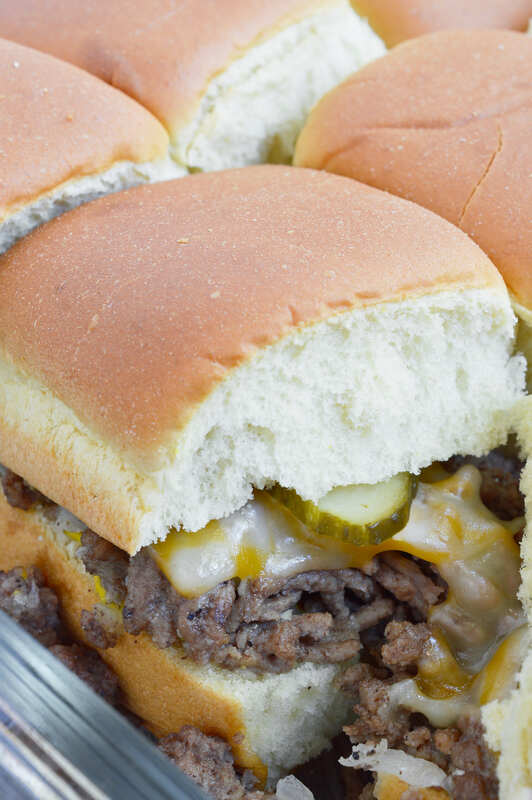 Top each with a scoop of prepared ground beef chuck, half a slice of cheese (or more! ), 3-4 pickle slices and tops of rolls. Cover dish with foil and bake 15-20 minutes or until melty. 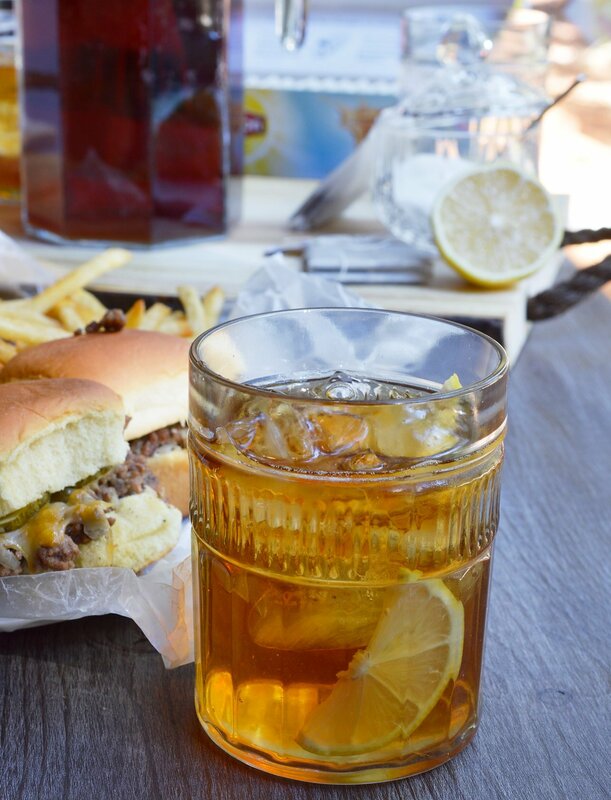 Serve with fries and sweet tea! Yes! Total game day food! This sounds great and easy. Those mini burgers look really good. Add some fries and a coke and you got yourself a meal. I want a whole tray of these for breakfast! These look delicious!! And I’m loving the cold brew iced tea!